For years, scientists and researchers have been attempting to synthesize alternatives to human growth factors to stimulate the skin’s natural healing abilities. In healthy youthful skin, growth factors, cytokines and matrix proteins all work synergistically to regenerate and repair damaged skin. Through a unique combination of cellular research, and our ability to extract and process the body’s stem cells from adipose tissue via a mini-lipo procedure, we have been able to harness the power of these signaling molecules produced by an individual’s stem cells. When combined with additional clinically proven ingredients, the result is an unmatched autologous skin care regimen unique to each individual. Adipose Derived Stem Cells (ADSCs) secrete various cytokines, growth factors and matrix proteins when cultured in our proprietary media. Each individual’s ADSCs secrete a personalized blend of cytokines, growth factors and matrix proteins to create Autokine-CM™, conditioned media that is specific to the individual.When applied topically to the skin, these signaling molecules provide numerous anti-aging benefits to promote facial rejuvenation. Stem Cells found in most multi-cellular organisms are characterized by the ability to self-renew through mitotic cell division and can differentiate into a diverse range of specialized cell types. Serving as the body’s repair system, they can divide to replenish other cells and regenerate tissue. The future holds great promise to heal the body through autologous cellular therapy and regenerative medicine. Adult stem cells derived from adipose tissue are being investigated globally to treat and potentially cure a multitude of illnesses and diseases, repair damaged tissue and organs, regenerate wounds and to rejuvenate aged skin. 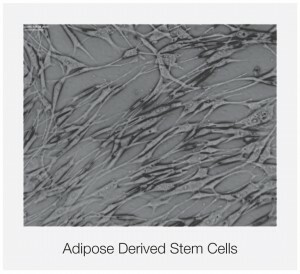 WHY ADIPOSE DERIVED ADULT STEM CELLS? Scientific interest in Adult Stem Cells from adipose tissue (fat) is focused on their ability to transform into many different cell types. Adipose (fat) Derived Adult Stem Cells are the most abundant type of Adult Stem Cells in the body. They are readily accessible and easy to collect. Fat tissue contains quantities of Adult Stem Cells that are up to 1000 times greater than that of bone marrow. Fat is easy to access and economical to collect. Fat collection is a simple procedure that can be performed in your physician’s office. Generally, it is minimally invasive with a short recovery period and can be extracted in conjunction with other procedures. Personal Cell Sciences U Autologous skin care suite uses your own adult stem cells to create the world's first skin care line designed and created especially for you. Experience what your own stem cells can do for your beauty and your future health by becoming a U member today. © 2019 Personal Cell Sciences.